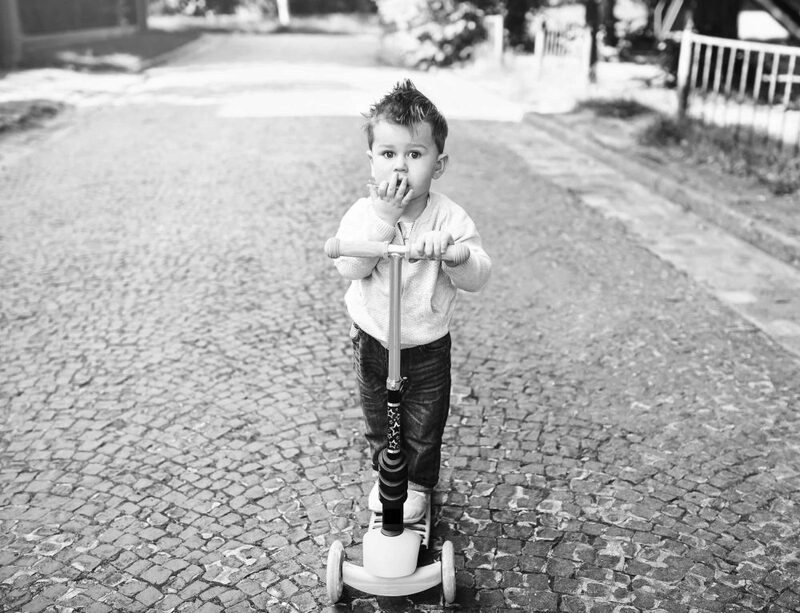 There are many great reasons for adults to enjoy scooters. They are fun to ride around for leisure, and they can actually make a lot of sense for getting around if you want a unique way to commute. However, due to the rise in popularity in scooters for adults, the market is flooded with options. We’ve reviewed adult scooters to come up with this list of the best options available today. 22 What Makes a Scooter the Best? Here’s a quick look at the top 19 scooters that we reviewed for adults so that you can easily compare the options. 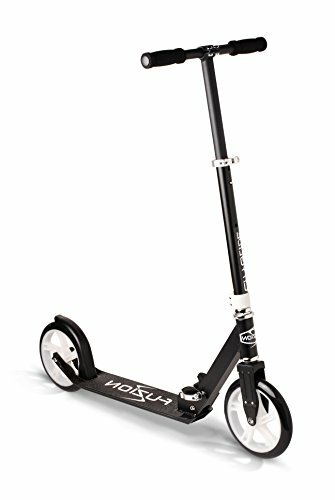 Razor A5 Lux Scooter 4.5 220 lbs. 9.4 lbs. Check on Amazon! 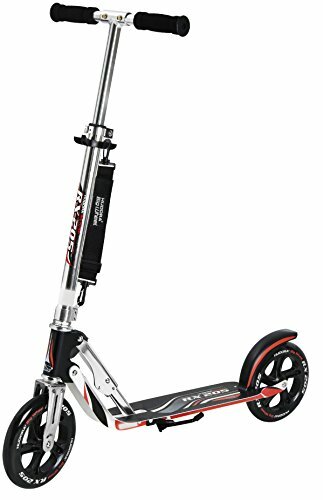 Fuzion Cityglide Adult Kick Scooter 4 220 lbs. 9.9 lbs. Check on Amazon! 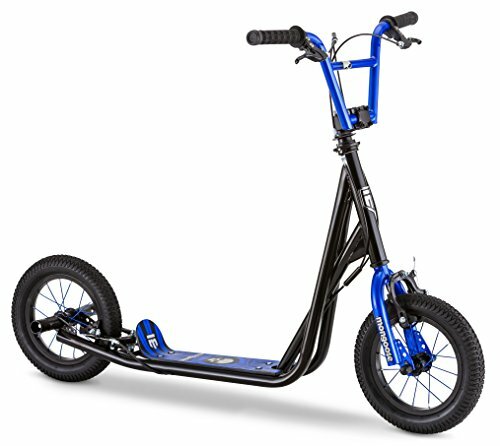 Globber One K 180 Adult Folding Scooter 4 220 lbs. 15 lbs. Check on Amazon! 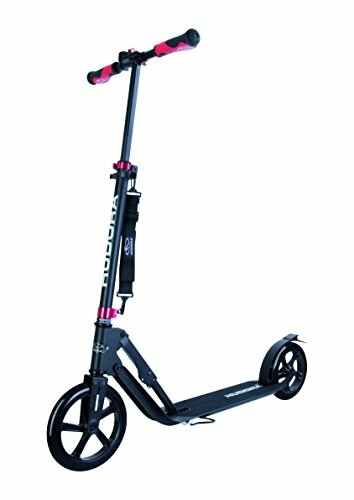 Fuzion CityGlide B200 Adult Kick Scooter 4 220 lbs. 9.9 lbs. Check on Amazon! Hudora 205 Adult Folding Kick Scooter 5 220 lbs. 5.5 lbs. Check on Amazon! Schwinn Adult Shuffle Scooter 4 250 lbs. 27 lbs. Check on Amazon! Goplus Folding Kick Scooter 4.5 220 lbs. 10 lbs. Check on Amazon! 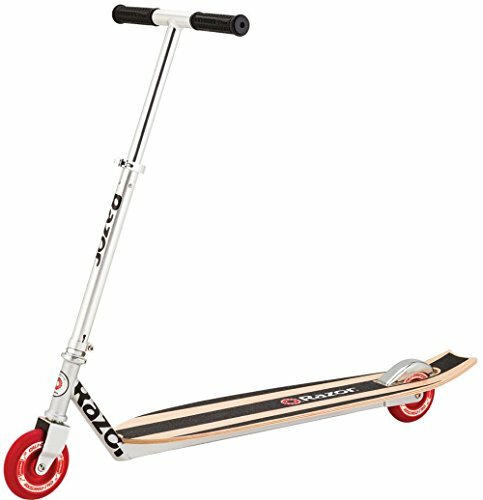 Razor A6 Scooter 4.5 220 lbs. 9.4 lbs. Check on Amazon! Hudora 230 Big Wheel Kick Scooter 4.5 264 lbs. 11.02 lbs. Check on Amazon! Mongoose Expo Scooter 4 220 lbs. 18 lbs. Check on Amazon! Hudora 230 Adult Scooter 5 220 lbs. 5.5 lbs. Check on Amazon! Razor Pro RDS Dirt Scooter 4.5 220 lbs. 9.4 lbs. Check on Amazon! 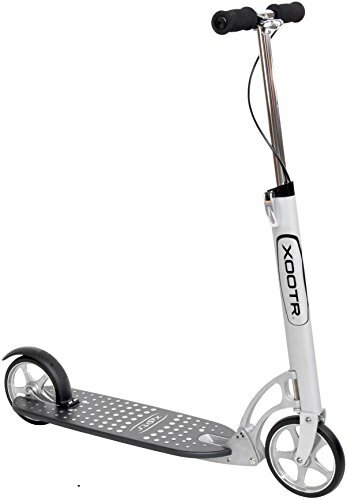 Xootr Adult Kick Scooter 4.5 250 lbs. 9.9 lbs. Check on Amazon! Globber Adult One Kick Folding Scooter 4 220 lbs. 15 lbs. Check on Amazon! 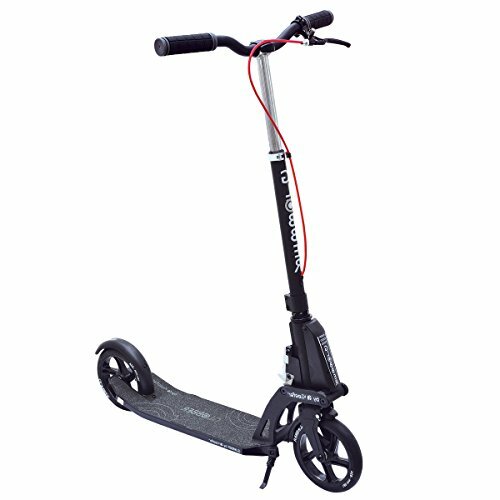 EXOOTER M1850 6XL Adult Cruiser Kick Scooter 4 220 lbs. 11.5 lbs. Check on Amazon! 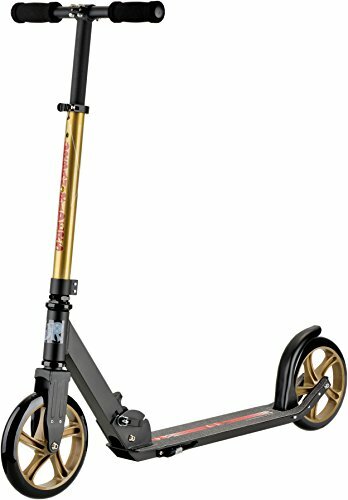 Urban Riders Commuter Special Adult Kick Scooter 4 220 lbs. 9 lbs. Check on Amazon! 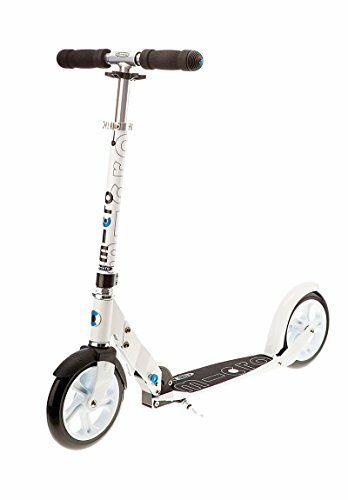 Micro White & Black Adult Scooter 4.5 220 lbs. 10.3 lbs. Check on Amazon! Razor California Longboard Scooter 4.5 220 lbs. 9.2 lbs. Check on Amazon! Micro Black Scooter 4 220 lbs. 10.3 lbs. Check on Amazon! Here’s a closer look at the pros and cons of each of the scooters that made our “best of” list. This is one of the most affordable adult scooters that you can find on the market today. However, don’t think that affordable means cheap. The Razor brand is well-known for great quality. They use a strong aluminum frame, which keeps the scooter lightweight. The pros of this scooter include a rear brake that helps you control the speed, the folding system that makes this scooter convenient to carry, the large wheels that keep you rolling even over uneven surfaces, and multiple color choices. The main con of this scooter is that the deck is small, which may not be ideal for people with larger feet. But if this is not an issue for you, this scooter is a great way to get started with adult scooters if you are a beginner or are on a tighter budget. 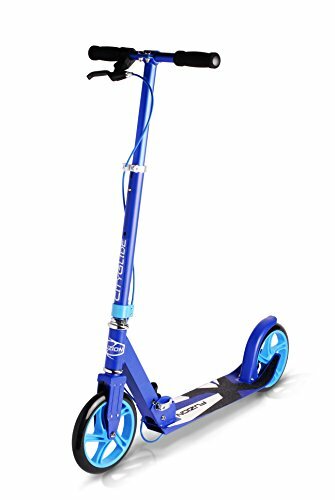 This is also a great scooter for teens who want to try out a scooter. CLICK HERE FOR RATINGS, REVIEWS & PRICING ON AMAZON.COM! This is a lightweight adult scooter that boasts the ability to pick up some serious speed on downhill rides. The Fuzion bearings are rated very highly, giving the wheels the ability to spin faster and more efficiently. To counteract the speed, Fuzion equipped this scooter with dual brakes, one on both the front and the back. 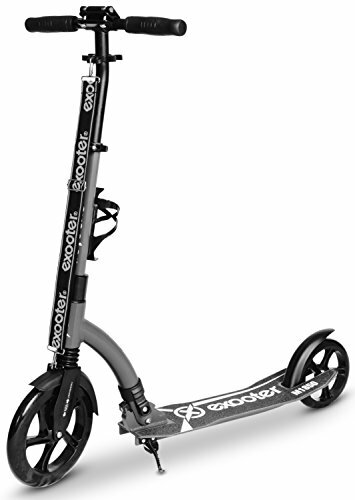 This scooter is made to go on any terrain, and has a nicely adjustable handlebar that can be comfortable for adults ranging from short to very tall. It is also a more affordable model than many others on our list. Globber is a French scooter company that is the industry standard, making top-notch scooters for adults that almost cannot be matched. They aren’t outside of a reasonable price range, and they perform like a dream. They fold up very compactly, and they have a very comfortable design. The handles are ergonomic, the deck is large enough for adult feet, and when folded, you can pull the scooter behind you like a suitcase. The big downside to this one is that it lacks suspension, but that’s not a common feature in most adult scooters meant for urban riding. So long as you aren’t riding in any extreme terrain, this is going to be one of the most comfortable scooters you can choose. Finally, the adjustable handlebars will get tall enough to suit someone over six feet tall. The Fuzion CityGlide is a very lightweight scooter for adults that features a dual brake system, which means you control brakes at both the front and the rear. This can make new riders feel safer, and can also be great for those who like to ride downhill and pick up serious speed. The pros of this scooter include the ability to ride on just about any surface, the fact that it is very affordable, and the fact that the handlebar is highly adjustable – in fact, it can be adjusted high enough that this scooter is more comfortable for adults over six feet tall than most of the others on our list. The only true cons are that some adults find the blue and black style a bit juvenile in appearance, and that it can feel a bit lightweight, which may make you feel as though you can’t take this scooter into more uneven or rugged terrain. The Hudora 205 is a crowd pleaser right out of the box because it comes totally assembled. Many adult scooters do require assembly, so this is a big plus for Hudora. The handlebar is adjustable, and the stylish look of this scooter makes it stand out from the many other basic black and silver designs. The wheels on this scooter are designed to be quieter and to grip pavement very well, making it great for commuting or getting around in a city setting, but not so great for rougher terrain. For commuters, this scooter is ideal. It includes an easy folding mechanism, a shoulder strap, and a very compact design that fits under the seats of a bus or other public transportation. This is one of the most unique scooters that we reviewed, and we love it. Styled very similar to a Schwinn bike, this scooter has an oversized front wheel that gives you a bike-like feel as you ride. You’ll maneuver the scooter like a bike, you’ll just kick off on the ground instead of pedaling. The design is classy enough to use for work commuting, but fun and whimsical enough to be a great gift for a teen. This scooter is made with both front and rear brakes of alloy, and it keeps everything controllable by keeping the wheels very light weight. It is still going to be significantly heavier than other scooters, as well as much larger, due to the design. But if you love that classic look and want something that maneuvers the same way as a bike, this scooter is ideal. It’s perfect for having fun with a unique scooter. While it would ride perfectly for a commute, the large size and the fact that it doesn’t fold up may make it hard to bring with you into an office or on the bus. The GoPlus scooter has many features that make it a lot like other brands that made our list, including extra-large wheels, durable materials, a rear fender brake, and adjustable handles. However, it’s the fun, brightly-colored styling that makes this scooter stand out. This is also one of the most affordable options on our list, making it perfect for teens and beginners. It is extremely lightweight as well, so it’s easy to carry with you on a bus – and the very compact design means it will fit under a bus seat as well. This scooter would be perfect for someone who is curious about scooters, but not yet sure if they want to commit. Razor is a great no-frills brand that makes durable scooters for adults that want to enjoy some fun. These are primarily recreational scooters, made with lightweight frames, big wheels to handle all terrains, and durable materials. These can be ridden by adults or children, and can handle light commuting if you just need to go a short ways on easy terrain. These scooters lack a brake or suspension, but that also means that you can skip complicated maintenance. If what you want is a basic adult scooter for a great value, the Razor A6 is perfect. Hudora is a company from Germany that makes very high-quality scooters from aluminum alloy. This very lightweight material is extremely durable, but also allows the company to create their most well-known feature, which is the very stable ride that Hudora is known for. Beginners will find that this scooter is ideal for learning to ride. Other pros for this Big Wheel scooter include a very tall handle that can be adjusted, which goes high enough to accommodate someone nearly seven feet tall, an ergonomic design for total comfort, a warning bell for riding in crowded areas, and a shoulder strap for easy carrying. This scooter is more expensive than other models on our list, but it is made with cutting edge technology that German designs are known for. The larger wheels on this scooter are what give it such an even, balanced ride on any surface. The Mongoose Expo is a very durable scooter that has a more classic scooter look, and is made for riding in all types of terrain. The wheels are meaty and sturdy, perfect for gravel, pavement, or grass. It is also a very smooth ride, even over uneven terrain and potholes, making it perfect for commuters. There are a couple of cons with this scooter that others on our list didn’t have. First, this scooter is lacking in the brake department, which could be a problem if you frequently go downhill. Second, this scooter was hard to assemble out of the box, which can be frustrating for someone who doesn’t have experience with assembling a bike. Overall, this scooter is a great choice if you have to commute through, or just like to ride through, many different types of terrain. This is another lightweight and durable option from German company Hudora. This scooter features a basic design for adults that want to try out scooters for the first time. Comfortable, durable, and classic, with tall handles that can be adjusted for adults of all heights, sum up the Hudora scooter experience. This one is great for beginners because it is wider and easier to balance on. If you want a more robust scooter from the brand that brings you great entry-level scooters for adults, try this one. The RDS Dirt Scooter from Razor is a meatier cousin to the basic Razor, with bigger wheels that offer more traction, and a more durable design. This scooter is made for having fun off-road, but is also perfect for commuting if you need to pass over potholes, uneven sidewalks, gravel, or grassy areas. Like all Razor scooters, there aren’t many extra frills on this one, but you’ll get a fantastic value for your money and you can try out some fun new terrain on your scooter without worrying about damaging anything. Xootr is one of the best quality brands out there for adult scooters. This is one of the more expensive options on our list, but for good reason. Their designs are extremely durable, and they have larger wheels that are far more rugged for all terrains. This scooter includes hand brakes to help you feel safer as you ride. Globber is one of the more well-known brands in the world of scooters. They are made with a powder-coated metal that is very durable and comfortable to use. The brake on this scooter is controlled on the handlebar, which may make new riders feel safer as they are learning to ride. 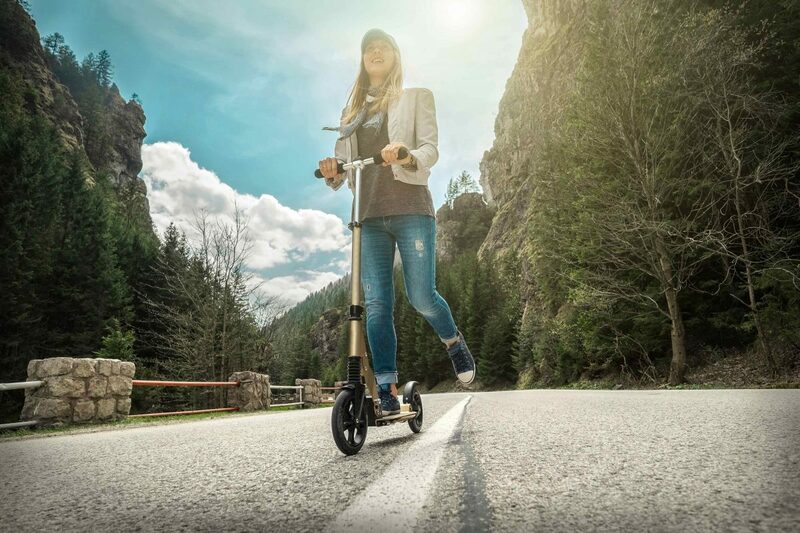 Other pros of this scooter include: large wheels that can be used on various terrains, very low weight that makes this foldable scooter easy to carry, a mudguard to keep you protected from mud and splashes, and an easy folding mechanism. The curved shape and large size of the handlebars also makes this scooter a favorite because it’s much easier to grip and maneuver. Many users like this scooter for things such as dog walking because the brake system is so responsive. The Exooter is a very sturdy adult scooter that is made for short urban commutes where you need to regularly traverse bumpy asphalt, uneven sidewalks, and other less-than-ideal surfaces. This one has suspension in the front and back so that you don’t have to feel the shocks from the terrain as you ride, which makes it better for adults with arthritis or painful joints. The bearings on this scooter are rated ABEC 9, which means that the wheels will be fast and efficient. It’s not a great choice for younger teens or kids because of how fast it can go. It also folds into a very compact shape for carrying, and includes a shoulder strap so that you can hop on the bus with your scooter. This scooter is also more affordable than many others on our list, despite being very durable and well-made. This scooter is considered one of the most effortless adult scooters on the market. It is designed to fold, unfold, and ride with as little energy on your part as possible, totally meant for commuting and getting around efficiently. 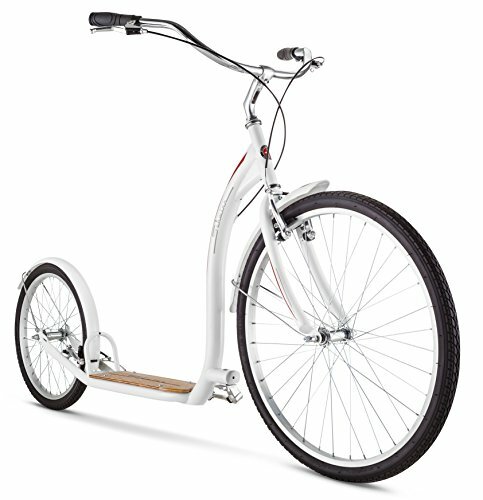 It has adjustable handlebars, it is made of very high-grade aluminum, and is very reasonably priced. However, this scooter lacks in any more exciting features. While it’s very well made, and very well priced, it doesn’t have anything like dual brakes or suspension. Overall, this would be a very good choice for a beginner or someone who prefers just the basics. The Micro scooter combines style with versatility in a way that makes it a favorite for adults and teens alike. The classy black and white style is perfect for commuting around town or to work, but the wheels are very robust so that you can take this on many surfaces. 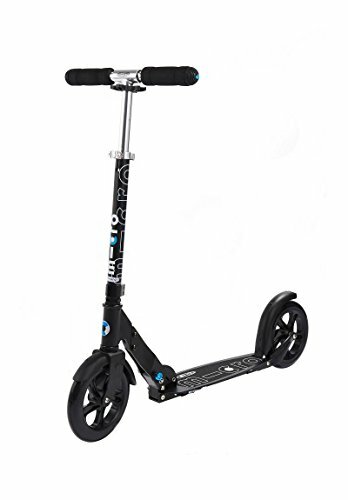 Some pros of this scooter include the fact that the kick height is low, so you don’t have to bend your knee to kick off, the very high quality of every component that makes this scooter very durable, and an adjustable handle bar. However, this scooter does have one con: It has a narrower deck than other scooters, which may not work for those with bigger feet. This scooter is primarily a great choice for anyone who wants a more sophisticated-looking ride for commuting around the town, and who intends to really use their scooter a lot. This is one of the more stylish options on our list. The Longboard scooter has a deck that looks like a longboard skateboard, which gives you more stability and comfort as well, due to the wider and longer shape. 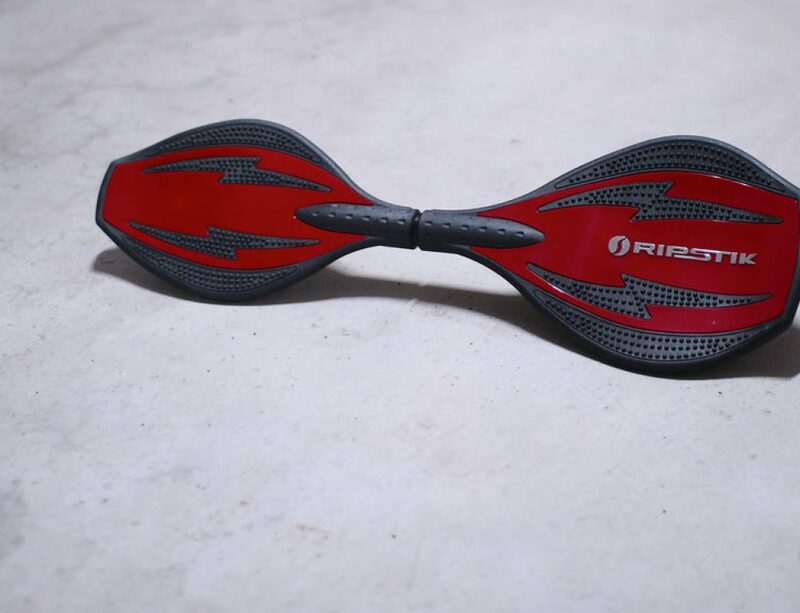 It has adjustable handles, and even a kick tail so that you can do a few tricks when you’re having fun on your scooter. However, this probably isn’t the best scooter for getting around or commuting. 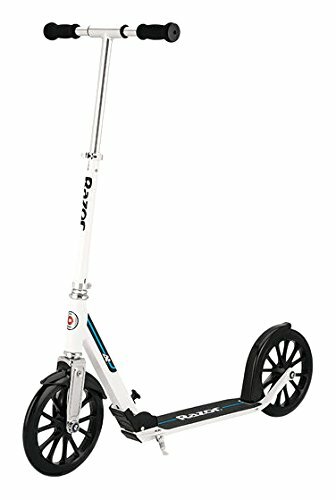 It’s an entertainment item first and foremost, but it’s great for those who want to learn on a more stable scooter than other models. It’s also a great way for a skateboard lover to get into scooters. Micro is a Swiss brand that makes a very stylish scooter for adults that want to look professional and sleek while they ride. 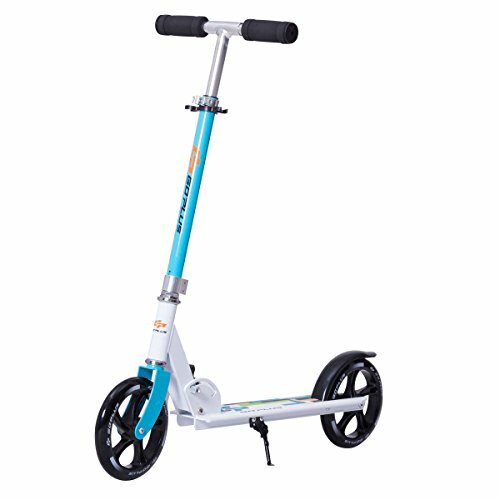 This one comes with large wheels that can handle rougher terrain if need be, and includes a unique locking feature that makes it safe to carry and ride this scooter. 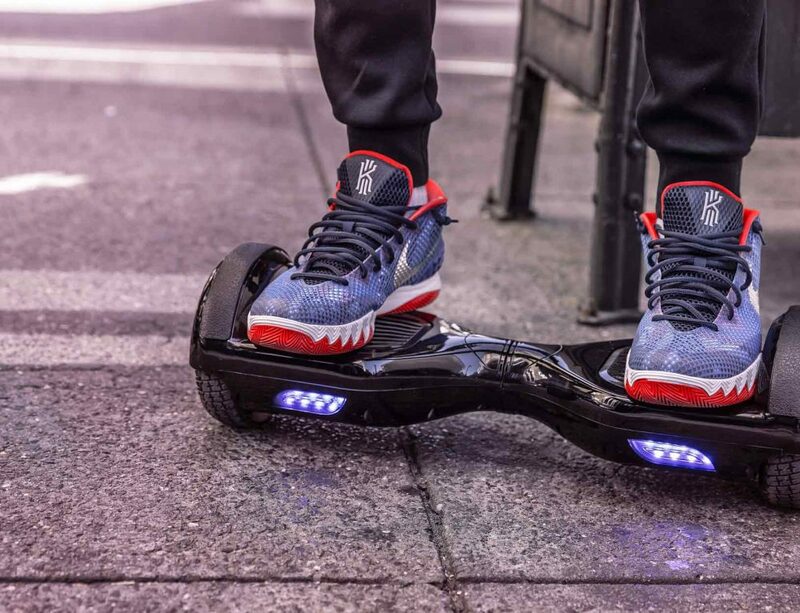 This scooter does not have any suspension or brakes – you control everything with your feet. For some riders, that could be a negative. For others, it means you can skip out on maintenance due to not having any brake leers or suspension parts that can break. Micro offers a great warranty on their scooters as well. This scooter is perfect for those who want to upgrade from an entry-level scooter to something more stylish and sleek, but who don’t want a complex design that will require them to maintain anything. What Makes a Scooter the Best? 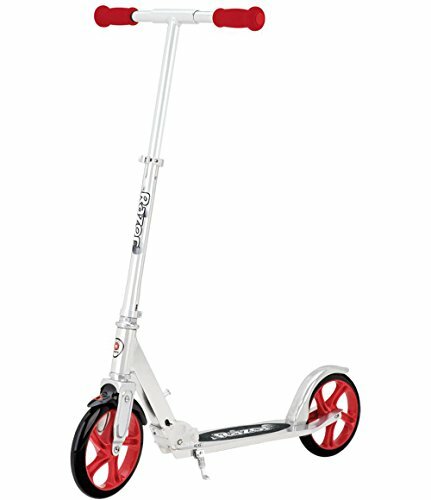 A lighter scooter will be easier to carry with you and to propel; however, a heavier scooter may make you feel more stable during your ride. Most adult scooters are rated for up to 220 pounds; however, you can find some scooters that can support up to 300 or more pounds. Some scooters have front brakes, some have rear, some have brakes in both the front and rear, and some have hand-operated brakes. 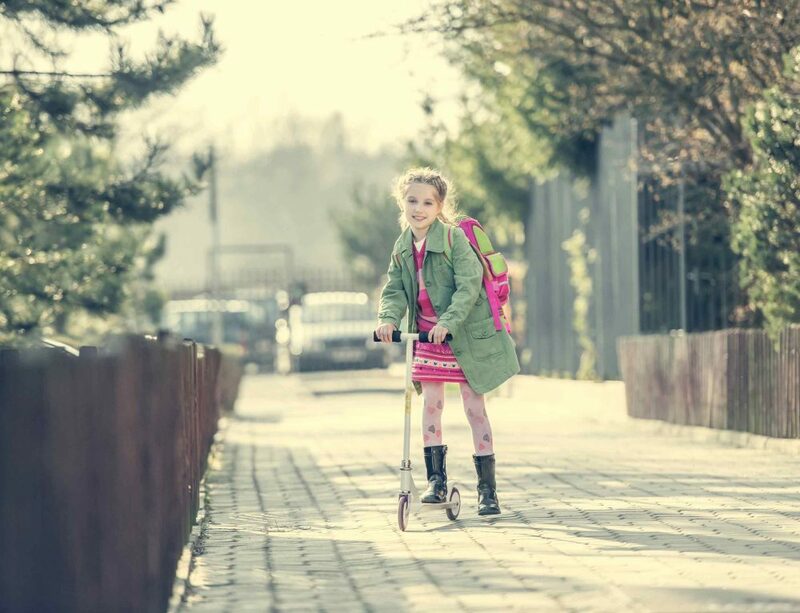 The best scooters have adjustable handles so that adults can customize them to suit their own height. If you have large feet or a wide stance, you’ll want a longer deck. Adult-sized scooters that have very short decks aren’t as versatile for riders. 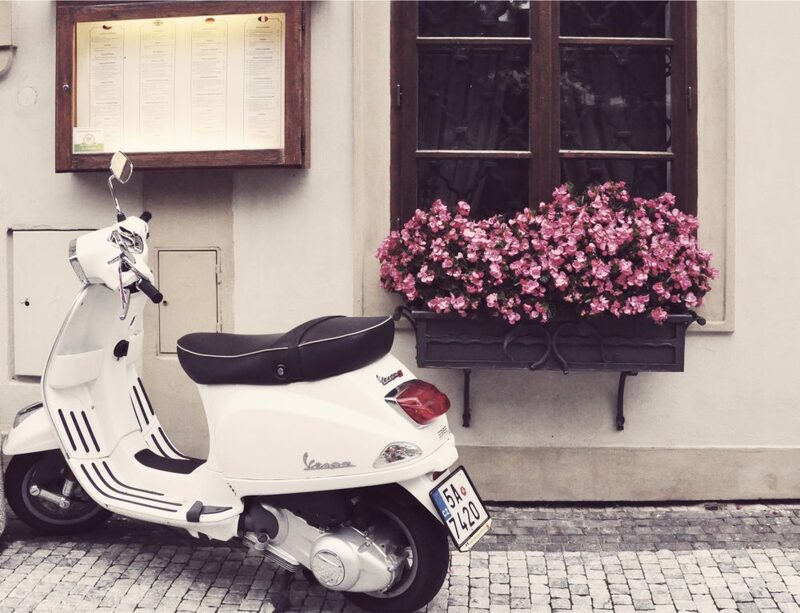 With these factors, you can compare scooters and find the perfect ride for yourself. These top adult scooters are ideal for anyone who wants to have some fun, get around in a unique way, and try something new.